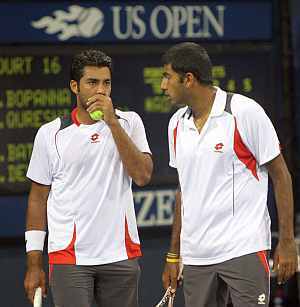 It has been a great week for the Indo-Pak duo of Rohan Bopanna and Aisam-Ul-Haq Qureshi (Known as Indo-Pak express by their fans) as they have been conferred with the “Peace and Sport” award by a Monaco based foundation. With both their countries at the loggerheads for the past 60+ years the duo has proven that there can be in fact peace. It’s not like these two have suddenly gotten together and received this prize but have been together for the past few years and their sudden raise in the rankings have finally got them some attention. Both these players should be really proud of this achievement as this has proved that sports can be devoid of politics and can surely extend a hand of friendship. It will be great if others can follow the example of this Indo-Pak duo and shed all their differences and work for a peaceful existence. Kudos to the Indo-Pak express for setting up a brilliant example for others to follow. Finally I would like to sign off with the quote of the “Peace and Sports” founder Joel Bouzou “”Sport is ready for peace. But will governments rise to this challenge?” he asks, a question to both the governments. Something for the governments to think about.